This poster abstract is an update to the paper that was published in Archives of Dermatology in 2007 and was covered by Rosacea News as Sansrosa’s sister to enter redness race. This now expanded abstract suggests that oxymetazoline is effective for up to 6 hours after application and no side effects have been seen after 3 months usage. Oxymetazoline is a related compound to that which forms the basis for the sansrosa product. As I previously noted, this is good news for rosacea sufferers as it means there may well be a choice between 2 topicals that can help address the redness and flushing of rosacea. Poster Abstracts, American Academy of Dermatology 66th Annual Meeting, February 1–5, 2008, San Antonio, Texas. Supplement to the JAAD, Feb 2008, Volume 58, Number 2. Poster Abstract P400, Successful treatment of the erythema and flushing of rosacea using a topically applied selective α1 adrenergic receptor agonist, oxymetazoline, Stuart Shanler, MD, Las Cruces Dermatology, Las Cruces, NM, United States, Andrew Ondo, MD, Las Cruces Dermatology, Las Cruces, NM, United States. erythema (flushing) and/or persistent erythema, and may be accompanied by facial edema, burning, or stinging. ETR in general responds poorly to treatment and there are no effective topical therapies directed towards the erythema and telangiectasias. While rosacea remains a disorder of uncertain etiology and pathogenesis, the abnormal flushing and persistent erythema have usually been theorized to arise from a progressive dysregulation of the cutaneous vasomotor response resulting in an abnormal and persistent dilation of facial blood vessels. The mechanism of such ‘‘dysregulation’’ has never been elucidated. The regulation of the cutaneous circulation is extremely complex and activation of adrenergic receptors (adrenoceptors) present on vascular smooth muscle may result in vasoactive changes that are difficult to predict. Recent studies, however, have demonstrated that the contraction of peripheral vascular smooth muscle is primarily mediated by α1A and α1D adrenoceptor subtypes, and certain experimental models indicate several α2 receptors may play a role as well. Objective: An attempt to treat ETR using topically applied oxymetazoline, an overthe-counter drug known to be a potent selective α1A and partially selective α2A adrenoceptor agonist—a potent vasoconstrictor—was undertaken. Methods: A commercially available preparation ofoxymetazoline 0.05% solution was applied once daily to the faces of 4 patients with ETR. Clinical evaluation and high resolution digital photographs were performed pre treatment, 1, 3, and 24 hours after a single application and 1 and 3 months after initiating once daily application. Results: All 4 patients showed clinical improvement in the erythema, marked decrease in the erythematous flares (flushing), relief from the stinging/burning, and no adverse effects. The effect was noted within 1 hour of drug application, lasted more than 6 hours, and was maintained at 3-month follow-up. Conclusion: We propose that the erythema and flushing of ETR may be caused by an abnormal expression, function, distribution, or responsiveness of a adrenoceptors, likely of an α1 subtype, and that ETR may be successfully treated by the topical application of agonists selective for these receptors, such as oxymetazoline. DISCUSS: add a comment below or discuss this news item in the Non Prescription Topicals forum. Link to poster presentation is broken. It used to work because I’ve viewed it before, but now it’s kaput. FEBRUARY 2008 • Volume 58 • Number 2. Poster Abstracts, 66th Annual Meeting, February 1-5, 2008, San Antionia, Texas” from which this abstract is sourced, if anyone might find more value in this document. 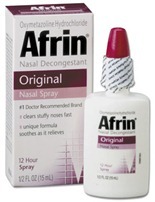 Oxymetazoline is used in several nasal products like Vicks, or Afrin….stuff like that. Perhaps we should get some and use it as a topical lotion?? Anyone ever try this?? Please advise! My dermatologist actually prescribed applying it 1 time daily as Finacea alone is not cutting. I tried it today…I actually see some difference!